Editor’s Note: This Savas Beatie author interview originally appeared at the Savas Beatie web site and appears at TOCWOC with written permission. This interview may not be reproduced without the express written content of Savas Beatie. For more details on this and other fine Savas Beatie books, please email the publisher at sales@savasbeatie.com. : Why did you decide to write your book on this particular subject? DD: The ’64 Valley Campaign seems to be overshadowed by the ’62 Campaign. I think this has a lot to do with the fact that the ’62 Campaign is the beginning of “Stonewall” Jackson’s military rise. The ’64 Campaign had a profound effect the country on both a military and political level. From a military perspective, if the Federals can take control of the region and destroy crops and supplies, the Army of Northern Virginia would have been severely affected from a logistical standpoint. By the same token, the campaign begins only a few short months prior to the 1864 Presidential Election. The re-election of Abraham Lincoln weighs heavily on the success of the campaign. A Northern victory ultimately helps guarantee that Lincoln will have a second term and that the war will be carried to a military end. 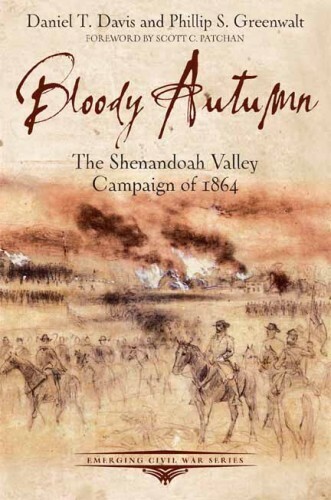 PG: To me, the Shenandoah Valley Campaign of 1864 is like a microcosm of the American Civil War in general. In a smaller geographic area, one sees a highly important military campaign that directly affects the political realm of the presidential election of 1864. If the Confederates are successful again—in an arena where they have known nothing but success—the sting of losing Atlanta could be assuaged. If they lose, one of the last nails in the coffin that is the Southern Confederacy will be hammered in. Besides the political and military ramifications of this campaign which takes place so close to both capitals, the level of expertise and experience in command of units in both armies is remarkable—from John Gordon to Rutherford B. Hayes, from Fitzhugh Lee to George Custer, some of the major players in Civil War iconography are here. Lastly, but not least, is the civilian aspect, once again the Valley residents find themselves on the front lines; and this time the destruction is devastating. With all these factors, this campaign is critical to a successful conclusion to the war for the North. : What was the most exciting part of writing the book? DD: The driving tour. We approached the stops by asking ourselves one question: “If I were here with a group, what information would I want to convey?” This allowed us to add depth to an already fascinating story. It also gives the reader the feel of being on the field at that moment in time when the events took place. PG: Echoing Dan, I enjoyed being able to share such a passion with the reader. It’s a great feeling to create and share driving tours in which we lead the reader and Civil War enthusiasts to the exact spots that determined the campaign. One can really appreciate what happened during the campaign when standing in the same places as the participants. : What was the most enjoyable aspect of writing? DD: Getting out and visiting the battlefields. Phill and I have been visiting Civil War battlefields and historic sites for years. To fully understand the story, you have to put yourself in the shoes of the people who lived it. The best way to do that was to walk the ground itself. It helps add perspective to what you are trying to convey. PG: Besides having the chance to make multiple trips back to battlefields with Dan, which is always a good experience, I enjoyed the scope of what the Emerging Civil War series is accomplishing. I liked sharing the passion I have for Civil War history, bringing some of the human element into the text, and matching that with appendices and a driving tour that allows readers to really “emerge” themselves into this all-important time in American history. Knowing that this book will be used on tours of the area and to introduce more people to our shared history is a great feeling. : What makes this book unique from others on the same topic? DD: I think this book really opens the door for further exploration in the Shenandoah Valley. Besides being overshadowed by the Valley Campaign of 1862, the battlefields today are protected by different entities and with the urban sprawl of Winchester, it can be hard to find a starting point to uncover the history. The goal of this book is to introduce people to the history that surrounds this campaign and the geographic area it encompasses. With a “Suggested Reading” section and appendices, the book also lays out a blueprint for further exploration and readings on the topic. PG: I tend to agree with Phill on this. The Civil War in Virginia in 1864 is focused on the Overland Campaign and the Siege of Petersburg. What happens in the Valley that autumn tends to be glossed over. I think the book serves as a wonderful start to reinvigorating the Civil War community’s interest in the campaign. : Do you have any plans after this project? DD: Yes. Phill and I are working on two more books for the Emerging Civil War series. The next is on Cold Harbor and is titled Hurricane from the Heavens: The Battle of Cold Harbor, May 26-June 5 1864. After that, we are planning on writing a book on Forts Henry and Donelson. PG: From there, we have a few other ideas brewing; both collectively and individually. PG: Thank you, our pleasure.